Pilgrimmage Compostella Trail from Puy en Velay to Conques, Rocamadour and Moissac. The classic of all trails Compostella de Santiago by the Aubrac, the Lot valley, Conques, Rocamadour on the Causse du Quercy, Cahors to Moissac. 9 or 10 days from Le Puy en Velay to the Lot Valley, Conques Rocamadour and Moissac. hotels and chambres d'h?es with WC, shower/bath en suite (No dormitories). ** hotels, optional *** hotels where available. the 39-1 : from le Puy en Velay to Espalion (by the Aubrac); 5 to 10 days. 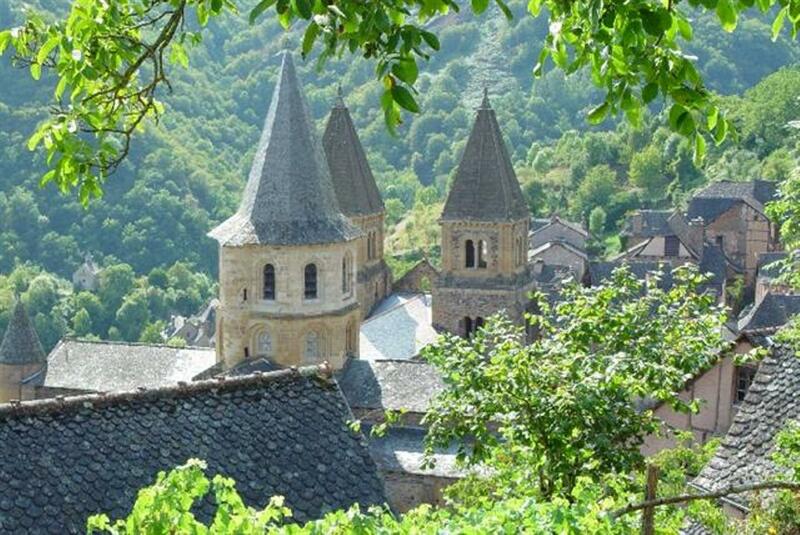 the 39-2 : from Espalion to Conques (in Lot valley); 4 to 8 days. the 39-3 : from Conques via Rocamadour to Moissac; 7 to 13 days. the 39-4 : from Moissac to Aire-sur-l'Adour. Mail us for a quote. the 39-5 : from Aire-sur-l'Adour to Roncevalles in Spain. Mail us for a quote. The "Via Podiensis" starting in Le Puy-en-Velay, is one of the four ways since 12th century to reach the Spanish sanctuarium of Santiago de Compostella. From everywhere in Christian world pilgrims came to pray at the relics of the apostle of Christ who in 44 has been tortured in Palestina and whose body has been buried in Galicia. Starting day: every day is possible. Day distances: 12-20 and 15 to max 28. We can't organize your walk in Spain after Roncevalles.